They even have lace edging! When my dear brother-in-law and his wife decided to buy me (ok, me and my husband) new tea towels for Christmas they probably didn't realise what a perfect gift this was. Oh yes, I am relatively easy to please when it comes to gifts, just get me something for my kitchen and I'll be a happy bunny! There's something a bit naughty about buying pretty tea towels for yourself. I mean, who doesn't have a drawer stuffed full of the things? It's never really something you need, and with the purse strings ever tightening, it's never something I buy for myself. 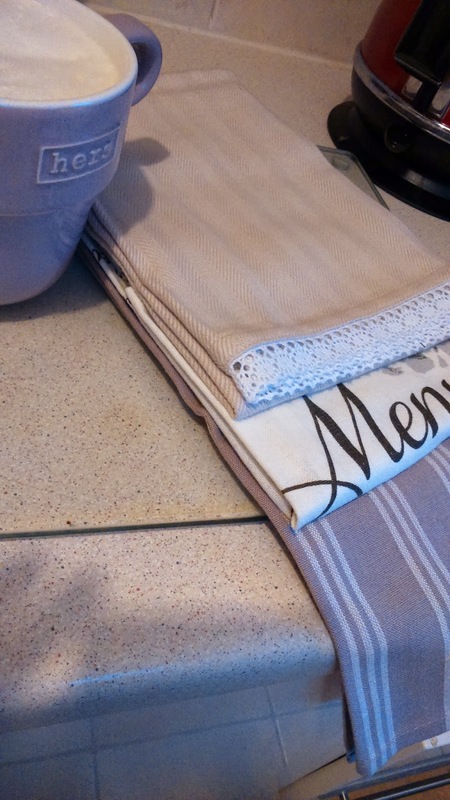 I have stacks of them - all of them faded, stained and creased, but they do the job of drying the dishes so to spend rare spare pennies on a nice set of pretty, crisp and un-creased tea towels (no, I've never heard of an iron) is a bit of a luxury. But when you're given a new set for Christmas (or birthdays, or just because someone else knows and shares your passion for kitchen linen), oh the excitement! I have had great fun today getting out my new tea towels and arranging them neatly over the drawer handles, relishing in their crispness before they get all damp and creased with their first use. These are particularly lovely and I was also given the oven gloves to match along with some lovely big mugs which are perfect for my daily latte. Who knew that one could get so much pleasure over something so simple? What's the best gift you've ever been given that to the outside world would seem so small and insignificant? *Just because I love it and know you will too.